Any parent would say that traveling with a baby can be a very tedious and tiring task. Parents must bring a variety of things such as diapers, bottles, and bibs, to name a few, wherever they go with their infants. Luckily for parents, manufacturers these days have designed some products for their convenience as well as the child’s safety. One of the products recommended by expert mommies is a 3-in-1 travel bag such as the Koalaty 3-in-1 Universal Infant Travel Tote. The Koalaty 3-in-1 Universal Infant Travel Tote promises convenience for parents and comfort for the infants. This product allows the baby to stretch out and sleep comfortably and for parents to lug along the stuff the little one will need. It is a very versatile item as it can also be used as a changing pad, a diaper bag and as a bassinet. This travel tote has four zippered compartments where parents can store items such as clothing, bottles, toys, diapers, and accessories. Its boxed-in surface is padded for the comfort of the baby. This foldable bag has adjustable shoulder straps, as well. The product also comes with two closure parachute buckles made from plastic, padded carry handles, and a disposable bag dispenser. This travel baby bag measures 14.5 by 14.5 by 4 inches when used as a bag and has the dimensions of 29 by 13 by 7.5 inches when expanded as a bassinet. The manufacturer claims to have used top-quality materials, particularly Polyester 600D fabric. The sides are reinforced with cardboard to keep the walls from falling. This travel tote also boasts of reinforced stitching to make it durable and is also waterproof and easy to clean as users only need to wipe it with a damp cloth. This universal tote bag from Koalaty promises convenience for the parents and comfort for the little ones. It can be used as a changing pad, a bassinet or a travel bag. The product has four zipped compartments although none of them are insulated, which could be handy when bringing bottled infant formula or water. The manufacturer used Polyester 600D fabric for its material. The sides are reinforced with cardboard to prevent the walls from collapsing, and thus prevent the entrapment of the infant. This travel bag and bassinet is waterproof and easy to clean as users only need to wipe it with a damp cloth. Unfortunately, the bag is not washable. The area where the baby could sleep in is padded to ensure maximum comfort. Plus, this travel bag has adjustable straps, so parents have the option to place it on the stroller. The item comes with two closure parachute buckles made from plastic-padded carry handles and a disposable bag. 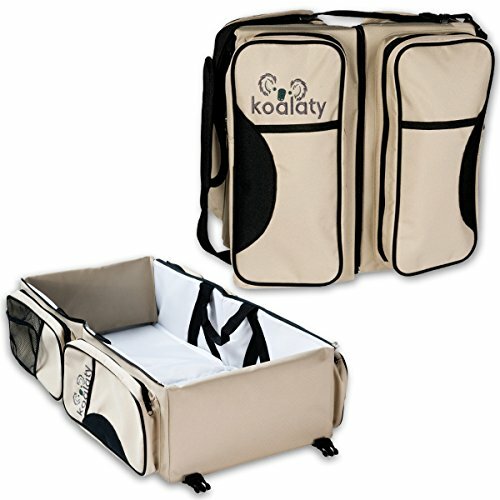 This Koalaty portable bag is highly similar to other products on the market as it promises versatility, comfort, and convenience. Other products such as the Scuddles 3-in-1 Portable Bassinet and Chubbi Baby 3-in-1 designer diaper almost have the same features as the bag from Koalaty. For example, the Chubbi Baby 3-in-1 designer diaper bag has five zipped compartments almost similar to the four pockets of Koalaty’s travel bag. However, Chubbi Baby’s product is better in the compartments as it has one that is insulated that is very handy for maintaining bottled liquids’ temperature. Both products have adjustable shoulder straps, allowing parents to attach the bag to the stroller. But unlike Koalaty’s product, the Chubbi Baby bag has no reinforced sides with cardboard. Plus, it also has a strong chemical scent, a let-down that Koalaty’s product does not share. On the other hand, the Scuddles 3-in-1 Portable Bassinet is similar in its desire to protect the baby. This 3-in-1 bag has special sticks to prevent the sides from collapsing. Just like the Chubbi baby bag, this Scuddles’ product has five zipped compartments including an insulated one for bottles or drinks, a feature that Koalaty’s bag does not offer. However, Scuddles portable bassinet may be considered a better bag as it allows users to easily put items inside when used as a bag, unlike the Koalaty bag, which fails to offer the same convenience. Koalaty’s 3-in-1 Universal Infant Travel Tote promises to make the lives of parents or carers more comfortable. This traveling bag is quite versatile as it allows individuals to use it as a bag, a changing diaper pad and even as a bassinet. Parents do not have to worry about the little one’s safety when sleeping on the item. It has reinforced sides with cardboard to prevent entrapment as the walls are unlikely to collapse. It has a padded sleeping area to ensure the comfort of the babies. The manufacturer has given much thought to the convenience of the user with the product’s design since the bag has zipped compartments and adjustable shoulder straps. Unfortunately, Koalaty missed out on one important feature, the insulated pocket where bottles and other liquid items can be placed. Other product makers included this feature on their portable bags, but Koalaty failed to do so. But this is not to say that Koalaty has failed in its promise to ensure convenience and comfort for the users. The item is waterproof and easy to clean as users only need to wipe the surface with a damp cloth. However, if a user wants a washable bag, then this one from Koalaty might not be a perfect choice. Plus, as a bag, this universal tote may not be the best option as it can barely hold any items inside the bag, and users might need to place all their items on the outside pockets. Overall, Koalaty has produced a product that still provides convenience to parents or carers as well as safety and comfort for the little ones. But if a buyer is looking for a more functional bag that can carry a good number of items, then the Koalaty product may not be the perfect fit. But if the buyer values the bassinet function more than a bag, then it is a good item to purchase.